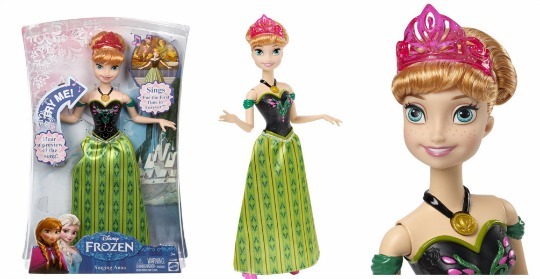 This Disney Singing Anna Doll from Frozen has been on my daughters Christmas list since she spotted it in the shops a few months back. I thought I had bagged myself a bargain for finding it for £20 in the Sainsburys Toy Sale this week, but Home Bargains have outdone themselves and are currently selling it for just £12.99! The Anna doll is dressed in her Coronation Day outfit and includes a gold necklace. When you press the button on the necklace Anna sings an excerpt from her magical song 'For The First Time In Forever'. This doll sings in 4 different languages also which is a really unique feature. It will make a brilliant present for any little Frozen fan this Christmas as well as saving you lots of pennies! It is home delivery only on this item which will set you back £3.49 however this is still cheaper than other places, Singing Anna is currently selling for £17.99 plus p&p on Amazon*.